The SA rugby legends association hosted the monaco U15 rugby team in Durban as part of a dynamic mulicultural youth programme. As part of a dynamic multicultural youth empowerment programme, the SA Rugby Legends Association hosted the Monaco U15 rugby team in Durban this past week. Partnering with the Princess Charlene of Monaco Foundation, the SA-Monaco Rugby Exchange Programme gives young players a chance to play in international tournaments and visit new countries as part of an ongoing rugby exchange programme. The rugby component of the 2017 Durban tour saw the young players receive a master class from legendary ex-Springbok coach Ian McIntosh, as well as Springbok rugby legend and SARLA CEO Stefan Terblanche, with a surprise visit from French rugby legend Clement Poitrenaud, who has just completed a season with the Cell C Sharks. On Saturday July 29, the Monaco team flew the flag for the Principality and the Princess Charlene of Monaco Foundation at an exciting 7’s rugby tournament arranged by Glenwood High School. The visiting team put on a great display of 7’s rugby and managed to convincingly win all three games against the SA home sides. 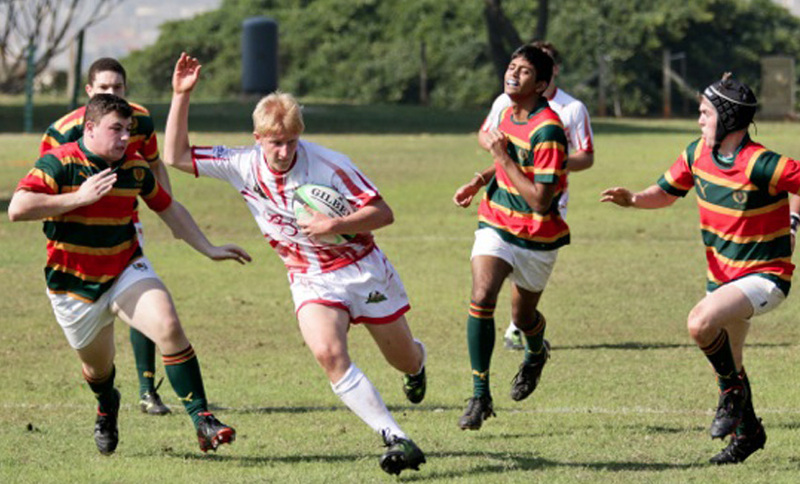 They beat the Glenwood U16 C team 37 – 10, and played the KZN Development teams from Lindelani and Inanda, beating them 31 – 14 and 28 – 19 respectively. The tournament was attended by some of SARLA’s special guests: SA 7’s head coach Neil Powell and SA 7’s Academy Manager Paul Delport, as well as SA Rugby Union manager and head coach of the SA 7’s Academy, Marius Schoeman. The team also had the opportunity to meet the Cell C Sharks Currie Cup team at their captain’s practice session at Growthpoint Kings Park and were each presented with a personalised Cell C Sharks jersey by Stefan Terblanche. They were also invited to attend the Cell C Sharks Currie Cup match on Saturday against the Pumas, and were welcomed onto the field at the end of the match to form a tunnel of honour for the winning home team. To round off a busy week, the visiting team was also taken to various tourist attractions around Durban, such as Ushaka Marine World, Tala Game Reserve, Phezulu Cultural Village, and Durban’s beachfront. The Monaco team also got to visit the Princess Charlene of Monaco Foundation’s swimming pool in Ballito, which is used to promote water safety awareness for the local community and encourage locals to develop their swimming skills.